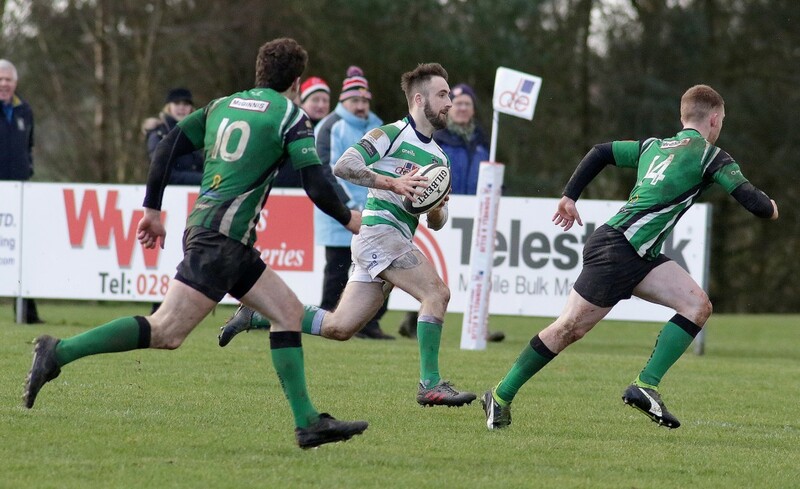 AFTER watching a somewhat makeshift and inexperienced Omagh Accies side slump to a 35-12 reverse at second placed Midleton last time out, head coach Phil Marshall admits that their play-off hopes are hanging by a thread. That result, coupled with Malahide’s win over Thomond mean the Leinster men have leapfrogged the Accies into the final promotion play-off spot in the table. However, the Accies entertain bottom side Thomond tomorrow (Saturday, kick-off 2.30pm), followed by a visit to Malahide and conclude their regular season campaign at home to champions-elect Ballina, which means victory in each should seal their place in the end of term promotion battle. “It’s a big ask! But it’s not beyond us,” acknowledged Marshall who was pleased to report that although winger Matty Eccles, who was injured during the warm-up at Midleton, is out, Neil Brown may be fit again, but Scott Elliott, Ali Beckett, Ricky Hemphill, Kyle Alexander and Johnny Sproule are also available for selection once more. “But things happen and you just have to get on with it. “A win is absolute, five points is the target! For us to go to Malahide and have any chance of winning the game with meaning, I think it has to be five points, just to make sure Malahide can’t gain any further ground on us. Looking back at the Midleton defeat, it wasn’t all doom and gloom for Marshall. Peter Scott, who can also play on the wing, showed up well at outhalf and several other fringe players got valuable All-Ireland League experience. And in the end, the guile and nous that comes with game time at that level is what proved the difference on the day. “We were well in the game and there was nothing between the sides in the first 50 minutes, maybe an hour, but the big thing that happened was their experience told,” Marshall confirmed. “Even though our twos are playing at a decent level, there’s a huge disparity between where they are and All-Ireland League rugby, which is incessant – physically, mentally and emotionally. And the learning won’t be just confined to that match, with the players having plenty to work on during training this week. “Three of their tries came from our mistakes, but they had an intercept score towards the end that skewed the score – they weren’t that much better than us,” Marshall added. “The score didn’t reflect the game at all, but once they got beyond two scores, we were got a bit frantic and it left us open. “The scrum functioned extremely well, but the lineout was ropey at times, which is something that will have to be addressed.